Motivated by the black hole firewall problem, we find highly entangled pairs of spatially localized modes in quantum field theory. We demonstrate that appropriately chosen wavepackets localized outside the horizon are nearly purified by ‘mirror’ modes behind the horizon. 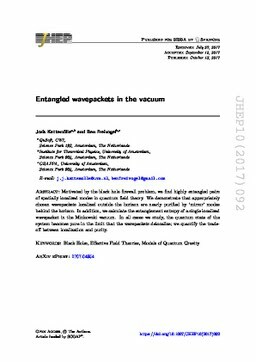 In addition, we calculate the entanglement entropy of a single localized wavepacket in the Minkowski vacuum. In all cases we study, the quantum state of the system becomes pure in the limit that the wavepackets delocalize; we quantify the trade-off between localization and purity.